Official release date was October 19 and Jon Sheckler celebrated it with a release show at the Nublu Classic. The album is available on iTunes, Amazon and Spotify. This album has a special setup: all songs have been written by drummer Jon Sheckler and sound is dominated by a Fender Rhodes. I have to admit that the Fender Rhodes piano is one of my personal favorites. For me, it still has this modern electric sound compared to a piano or grand piano. So good preconditions for me to listen to this album. The first song “Right Side Up” starts with an easy and melodic theme with nice rhythmic breaks, played very relaxed in medium-up tempo. The first solo goes to the piano, Steve Denny gets great support from Jon Sheckler and Aron Caceres stays focused. A bass solo with nice interplay with the piano comes next. Jon Sheckler plays the last solo of this tune. His excellent drums solo is straight and dynamic at the same time. Jon says about that song: “I wanted the first track to be an example of the whole album. It has a good singable melody that seems less complicated then it is. You don’t really feel the key changes and abnormal form.” And yes, this first song sets the stage for the whole album. It lasts a little bit over 7 minutes but is entertaining and diversified. “Cold Reading” is the second tune. It has a much slower and heavier groove. It becomes softer for a extensive bass solo and tension rises with the piano solo that follows. The song ends with a very nice and dynamic outro. The song “Junction Junction” is one of my favorites on the album. It is a 24-bars moll blues played in up-tempo. We hear a great piano solo, where Steve Denny is again fully supported by bass and drums and then Jon gets his chance to shine with a another perfect drums solo. The title song “Cityscapes” comes next. This is not really just a song only, it’s more like a suite. It has three different parts plus a drum solo between the second and third part. The first part lasts about 4 minutes, the second goes for 5 minutes, followed by the drums solo of about 2:30 minutes before the final part comes. The total playtime of this masterpiece is 15:47 minutes. Jon gives more details: “The three sections each represent a neighborhood in New York and New Orleans. The first section is based around Ridgewood in Queens, the second is inspired by Midtown Manhattan and the final act is meant to sound like the Garden District in New Orleans. The tune is so sprawling and the title invokes so much imagery that it had to be the foundation of the record.” The Ridgewood-section is quite contemplative and features Aron Caceres on bass. Midtown Manhattan starts soft before it really picks up and ends with piano and drums enlivening each other. The drums solo leads over to the Garden District part which is a sunny, almost Caribbean theme played with variations by the piano. The album continues with the tune “CBR”. Another highlight for me. A neat theme played in straight swinging style in the sound of a Jazz standard. Piano and bass play very good solos and the drummer has two 8-bar solo breaks, in typical jam style. “Each Others”, a beautiful ballad, comes next. According to Jon it is one of the songs that are “landing very well” with the audience. Especially the bass solo is very catchy. The last tune on the album is “3rd Floor Walk Up”. A steady 7/8 groove lays the foundation of this song. 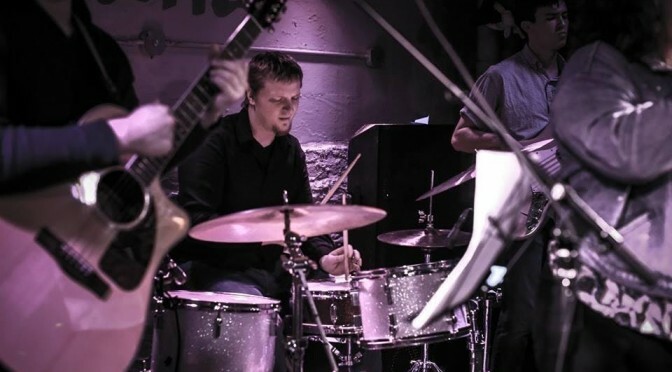 Steve Denny takes again the opportunity to play a fantastic piano solo and Jon Sheckler follows with an impressive and very dynamic drums solo. The song and the album fade out with a pulsating bass. Very cool. 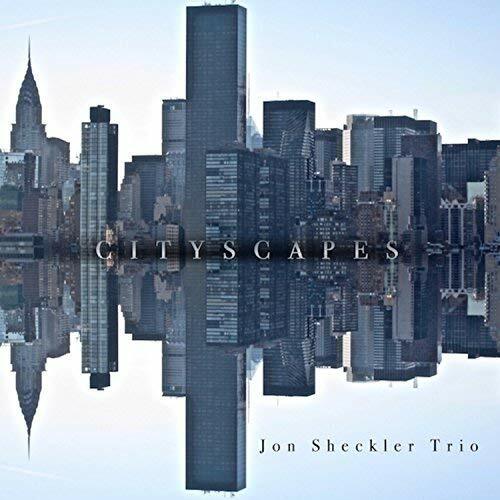 “Cityscapes” is an excellent album with a distinct sound. The Fender Rhodes piano creates this special and unique touch. All compositions have tonal centers and give the listener an easy access to the songs. The musicians are masters on their instruments and manage the up-tempo tunes in a very relaxed and easy way. The interplay is also remarkable and shows that these guys have spent a lot of time together and understand each other very well. So a clear recommendation from my side.